Baigalimaa Enebish, second from left, and members of her cooperative receive their land titles through the Property Rights project. Women’s participation in the economy is a key contributor to a country’s growth and development. A crucial dimension of that participation is women’s rights to property. Just ask Baigalmaa Enebish of Erdenet, Mongolia. Baigalmaa is a single mother and was recently living in a rented room in someone else’s home. She had no stable income and few employment opportunities. She noticed there were many women around her who were in the same situation, and she decided to invite them to join a group she formed called the Neighbors’ Friendship Cooperative to help solve its members’ housing problem. With Baigalmaa’s help, the cooperative received several grants from international donors to build a fence, extend the electricity grid and dig wells. They wanted to apply for a loan from the Asian Coalition for Housing Project, but a lack of collateral prevented them from doing so. “[Soon after], MCA-Mongolia’s Property Rights Project contractor, in a yellow vest and name tag, came knocking on our door, introduced the MCA-Mongolia Property Rights Project and explained that we could own land,” she said. Thanks to MCC’s Property Rights Project, the cooperative now has land on which they are building houses and which they are using as collateral to receive loan to build their homes. The project works to increase women’s awareness of the importance and benefits of owning land. 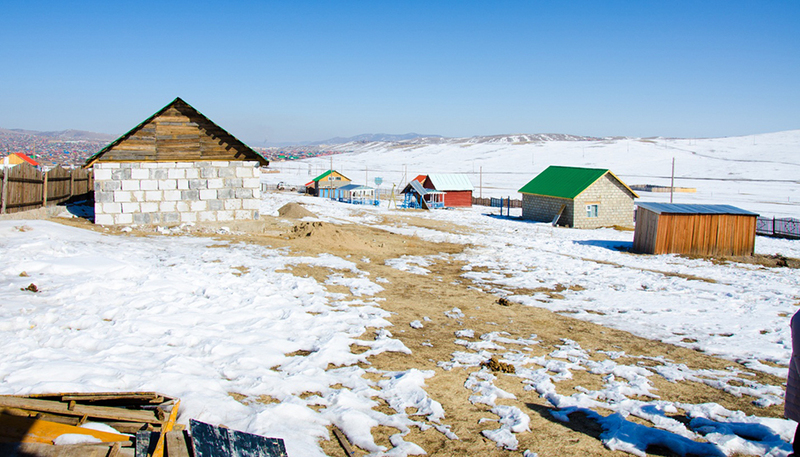 MCC invested $15.7 million to improve the efficiency, accuracy and accessibility of the land privatization and property registration process to make it easier, faster and more cost-effective for Mongolian citizens to register and transfer land. Through coordinated public outreach, project contractors, like the one at Baigalmaa’s door, educate women on the value of land and how to use it as a valuable asset, including as collateral for bank loans. Upon hearing of this opportunity, Baigalmaa acquired land quickly—in less than one month, compared to the average of between four and five months—thanks to the technical assistance provided by the project. She immediately recognized the importance of encouraging other women in the Neighbors’ Friendship Cooperative to do the same. Under her leadership, other members of the cooperative received land titles through the project. With land as collateral, they finally received a housing loan that they are investing in building six houses and providing four gers (traditional dwellings) to other cooperative members, accomplishing their ultimate goal. In the future, the cooperative is also planning to grow vegetables for household use. If they produce more than their need, they are willing to sell the surplus. A project contractor shows Baigalimaa Enebish, center, the cadaster map of her land. Already, women’s participation in land ownership in 2011 has increased by 5 percent in the different project areas. 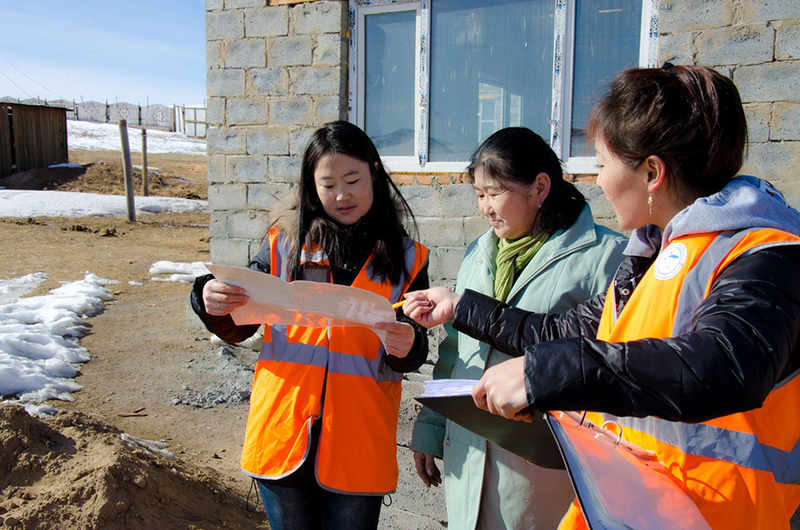 Women now hold approximately 40 percent of land titles in eight regional centers throughout Mongolia. 10,000 people have registered their land, benefiting from a one-stop shop that saves them time and money. Land ownership is helping both men and women invest in their land and have greater access to economic opportunities.